Do you have a conventional mirror in your bathroom? Well, an upgrade to the best fogless shower mirror is something you should do right away. In their functioning, fogless mirrors are designed to prevent the condensation of humidity on their surface. As you know, the environment in your bathroom can become very humid, particularly when you are having a hot shower. With a conventional shaving mirror in such a humid condition requires you to attenuate shaving to wipe the mirror from time to time. Fogless shower mirrors, on the other hand, prevent the formation of fog on their surface. This, in turn, gives you a clear view regardless of how humid your bathroom is. In order to buy the right product in the market, you need to know what to look for in a fogless shower mirror. For instance, you need to buy a product of the right size and shape, is easy to install and with the right lighting and magnification. 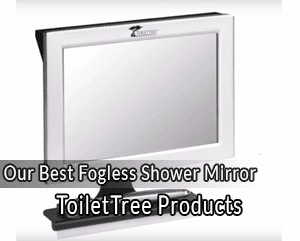 In addition to being a fogless shaving mirror, the Toilet Tree Fogless Shower Bathroom Mirror is aesthetically appealing and comparatively easy to use. In order to keep the surface of this mirror clear of fog, you are required to add hot or cold water into its removable water chamber before taking your shower. To do this, you need to slide the shaving mirror off its bracket and then fill the patent removable chamber with either hot or warm water. This will keep the surface of the mirror warm; hence prevent the condensation of humidity on its surface. The product is designed to mount securely on your bathroom wall. In this regard, the product comes with a removable adhesive for installation. As such, you will not need suction cups to mount your mirror. For added convenience, the mirror features a built in shelf. You may use this shelf to store your sponge, tweezers or even your shaving razor. A clean and comfortable shave requires a considerable amount of moisture in the bathroom. However, more moisture is not always good for the shaving mirror. 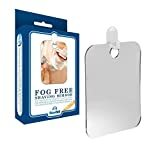 To ensure that the mirror does not fog under the heavy humidity, you need a reliable, high quality fog free product like the Deluxe Shave Well Fog Free Shower Mirror. Having been manufactured in the USA, you can rest assured that the quality of this product meets industry standards. As compared to its predecessor, the original Shave Well mirror, this product is 33 percent bigger. As such, it is guaranteed to give you a clear and precise reflection of your face for the close and clean shave you need. To ensure that your mirror does not fog while you are shaving, you need to hold it beneath the shower steam for a few minutes before shaving. This will warm the surface of the mirror, hence prevent condensation of vapor. As opposed to its competitors, the product uses an adhesive hook instead of suction cups; which are known to fail with time. 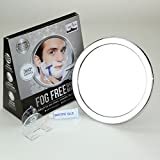 Are you looking for a fog free shaving mirror that is ideal for use in your bathroom, yet is lightweight for you to carry around whenever you are travelling? 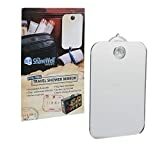 If so, you should look for the best light weight and high quality product like the Shave Well Fog Free Travel Mirror. Like the Deluxe shaving mirror reviewed above, this Shave Well product is manufactured in the USA. To warm the mirror, hence prevent fogging on its surface, you need to hold it under the steaming shower water for a few minutes before shaving. Having been designed for travelling, you will find the product small and lightweight enough for you to easily carry around. Despite its compact design, the product is still capable of giving you a clear, full reflection of your face. With the Upper West Collection 2 x Magnification Fogless Mirror, you will get clear and enlarged reflection of your face. This may be attributed to the remarkable 2 x magnification power offered by the product. As you might have noticed, this product is a bit larger and heavier than similar mirrors. To ensure that you get a secure mount with the product, the manufacturer uses Locking Suction for installation. You will also love the fact that the flexible arm used on the product may be rotated up to 360°. 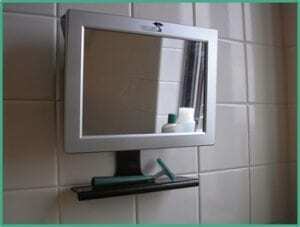 As such you will find it easier to position the fogless mirror closer to you while shaving. 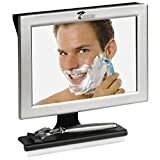 Here is another large, yet lightweight fogless mirror that will enhance your shaving experience. The new Fogless Shower Mirror by Cassani is unique in that it features a new facial contour design. In this regard, the model boasts of increased height and width to capture the entire face as well as the neckline. The wall mount stainless steel mirror has been proven to remain fogless for a considerable period when used in humid conditions. As a matter of fact, the manufacturer backs the performance of this product with a 30-day money back guarantee. Whether you want to pluck your eyebrows or shave facial hair in the bathroom, you will need the right shower mirror. The problem with conventional mirrors is that they will become fogged the moment you turn the shower on. This makes it impossible for you to see your reflection on the mirror, unless you wipe it. Having to wipe the mirror every few seconds is not only inconveniencing, it will also waste your time. To avoid this inconvenience, you should consider buying a mirror that is suitable for the humid conditions of the bathroom. With the right fogless shower mirror, you will be able to see yourself on the mirror regardless of how humid the bathroom is. However, choosing the right fogless mirror for your bathroom can be a daunting task. To begin with, you will have to choose from the numerous fogless mirror options available today. Fogless shower mirrors are available in a wide range of shapes and sizes today. With a small mirror in your bathroom, you will have to turn it whenever you want to view different parts of your body. Therefore, it is advisable to buy a mirror that is large enough for you to see the entire face at a glance. For mirrors with rather complicated installation, you may need to hire a professional to carry out the installation. If you are looking forward to installing the mirror on your own, you should go for the products that are relatively easy to install. Free-standing – these are the mirrors that are designed to stand on their own on the bathroom floor. This type of mounting will allow you to move the mirror to your desired position any time. However, these products are only suitable for the spacious bathrooms. Again, they are easy to knock off and may be unsafe if you have children in the house. Hanging – this is one of the commonest installation types for fogless shower mirrors. 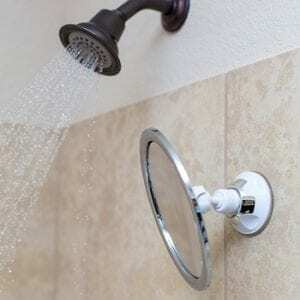 Hanging shower mirrors are best suited for bathrooms with a wall mounted showerhead. With such a mirror, you may have difficulties positioning it at the right height. Wall Mounted – if you do not wish to move the mirror from one position to another, you should go for the wall mounted fogless shower mirrors. In most cases, such products are permanently attached to the wall using adhesive strips, screws or suction cups. They are considered to be the safest, especially if the bathroom is used by kids. Heated Shower Mirrors – these feature a heating element that will heat the mirror to attain the same temperature as rest of the bathroom. This will prevent moisture from condensing on the surface of the mirror. Such products are effective, but may require special connections. Again, most of the heated fogless shower mirrors are wall-mounted. Powerless Mirrors – these do not require a connection to electricity. Instead, they feature a unique technology to repel moisture from the surface. Unlike conventional mirrors, some of the bets fogless mirrors have a variable magnification power. In some products, one surface is designed to offer a regular view while the other one offers a zoom view. In this regard, you need to flip the mirror to alter the magnification. This feature comes handy when you would like to focus on a particular area on your body, especially when you are shaving. Basically, most bathrooms are known to be a bit dark. This low light condition can, in turn, affect your ability to see the image on the mirror clearly. As a result, some of the leading fogless mirror models are equipped with LED lighting. In most cases, the LED lights are attached along the frame of the mirror. If your preferred mirror has this option, you should ensure that the LED lights are of the best quality. With poor quality lights, you will experience glare on your mirror. Poor lighting will also affect the reflective ability of the mirror, hence should be avoided. Even with utmost care, you may end up knocking your mirror down. This is the case with the hanging and the free-standing mirrors. As such, it helps to buy a mirror that can withstand a short fall. Basically, it is advisable to buy the shatter resistant fogless shower mirror models that are backed by a warranty. To enjoy a comfortable, close and clean shave, experts recommend that you keep the skin moist. This is best achieved by taking a hot shower. While this is a good practice, it also introduces moisture and makes it difficult to view a reflection of your face on the shaving mirror. To be on the safe side, it is advisable to buy the right fogless mirror. With so many products to choose from in the market, this can turn out to be a daunting task. However, this guide will make it easier for you to choose the best fogless shower mirror today. Hi, I am looking for the shower mirror for my bathroom. Seriously I don’t know before about type of shower mirror. After reading this I know about this. I think I am going for the wall mount type of mirror. thanks for this informative article.